What is float therapy and how did you get involved with it? Float therapy was developed over sixty years ago and is simply a tank filled with 11 inches of skin temperature water with over 1100 pounds of epsom salt so you float like a cork. The tank and room is designed to keep sensory input to light and sound to a bare minimum while you float effortlessly. With your body out of a tremendous amount of gravity you experience less pain, deep relaxation, stress relief, better sleep and more. I discovered float therapy back in 1996 during a business trip while dealing with my own chronic pain. It felt like a miracle when I got out of the tank for the first time and felt relief, and had one of the best nights of sleep I had in many years! I wanted to somehow make this available to people like me, people who hurt. In 2011 I found out the first float therapy conference was happening. I convinced Mark (my partner) to go with me and booked him two appointments to float during his time there. He loved it immediately and when we got back we started up conversations with the Department of Health to get float tanks available to the public. Twenty months later, we got the approval to open up the first float tank center in the state of TN! Just getting open was a challenge! It was the hardest thing I have ever done. People thought we were crazy, the health department thought we were crazy. We couldn’t get funding. No one would rent to us because they didn’t understand what kind of business we were starting. . People had never heard of float therapy so we had a lot of education to do! But we were relentless. We found someone who would rent us the tiny space we are in today. and I will never forget our open house where over 100 people showed up and bought their first floats. And the first day we opened, we were booked! It was amazing! I have so many! In the beginning, we were opened 24 hours a day on the weekend! Mark and I were the only employees and so we took turns hosting floats while the other slept on the massage table. Those late night floats left people so open and ready to share what was on their minds and what came up in their floats. We had soldiers dealing with PTSD who shared their stories and their journey to healing. We had an frequent overnight floater earning her masters while working full time and needed to catch up on sleep and get clear for her thesis. We had several people who shared their dreams to start their own float centers! Some of our first floaters were Greg and Chelsea from Weightless in Louisville, Ky and he original owners of Lucidity in Chattanooga, now owned by our dear float friend, Angela. Shared dreams make those people very special to us! We had a man come in, bent over, barely walking and leaning on his cane to take the few steps to his float room - and left after his float, leaving his cane behind! My favorite floats will always be the ones where people come out with hope in their eyes, feeling amazing and ready to live the amazing life they were meant to live! What other plans do you have for the float center? We recently opened our second float center, expanded to include a few new wellness tools we’ve discovered that compliment floating like Cryotherapy, Infrared Saunas, Massage Therapy and more. Float Alchemy in Murfreesboro, TN also has a kombucha taproom selling the kombucha my Father and I make along with our live cultured cheeses and butters. This is a passion project that came from almost losing my Father last year. You will be seeing more of our Leaf Alchemy kombucha and products in the very near future! When we feel good, we thrive! And I want to continue to create things that support people who want to change their lives, their community, and the world. 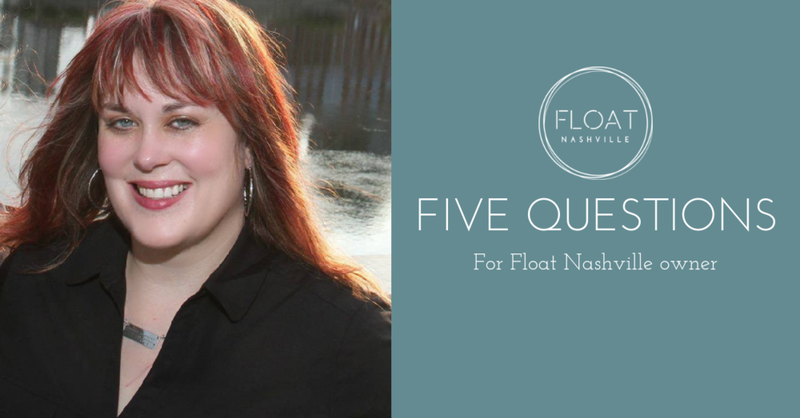 I would love to do one more float center, but they are a lot of hard work and we are working to make sure Float Nashville and Float Alchemy can provide amazing floats and serve our community in a way that meets our standards before moving on to the next project. What do you do when you aren’t at Float Nashville? Well, these days I am spending more time at Float Alchemy in Murfreesboro. But even when I’m not there working, I am usually there floating, reading, thinking, and dreaming. I think we all need a little more time to stop, dream and float in our lives.